Running a 10k for Fairmount Park - Kellbot! | Kellbot! I’m really excited to have snagged a bib for the Philly 10k in September! I’ve joined the Fairmount Park Conservancy charity team, and we’re raising money towards the trail restoration project at Belmont Plateau. I’m asking friends and family to support me by donating to the Fairmount Park Conservancy. For those not familiar with the Fairmount Park system, it’s made up of many parks throughout the city both large and small. 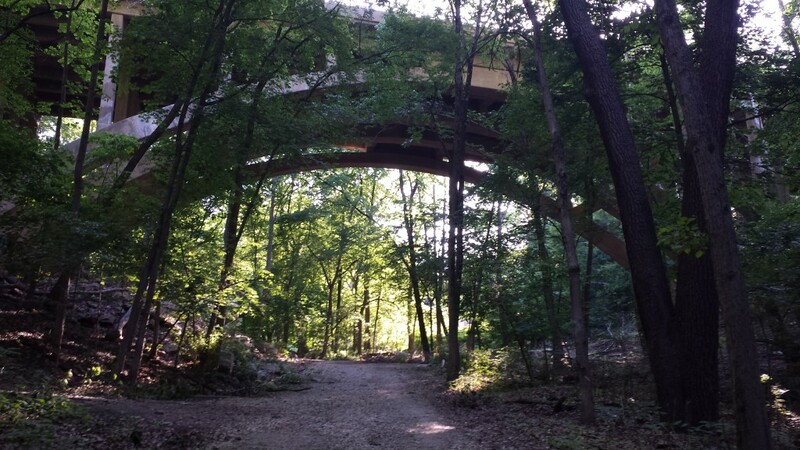 I most often run in two of the larger parks: the 1400 acre Wissahickon Valley Park, a beautiful forested area surrounding the Wissahickon Creek, and in the 4100 acre Fairmount Park along the Schuylkill River. By comparison New York’s central park is a mere 843 acres. The Fairmount Park Conservancy works with the city Department of Parks and Recreation to maintain and improve all 63 parks in the Fairmount Park System. Aside from being a great place to run and bike, our local vegetable CSA is grown on land owned by Fairmount Park. I feel incredibly lucky to live in a city with such a wonderful park system so near by. This run will be my first 10k. Previously my longest run at any speed was just over 3 miles, and a 10k is 6.2 miles long. I’ll be spending my summer increasing both my distance and my speed by following a 4 day a week running plan. By the end of the plan I hope to be able to run the 10k in under 65 minutes! Fairmount Park is such an integral part of my fitness and wellness and I am very proud to be part of their fundraising team for the Philly 10k. Please consider supporting both me and the parks by donating on my fundraising page. Our team goal is $5000, but every dollar is extremely appreciated. As of early June I’m a few weeks into my running training. I’ll be posting on Facebook and Twitter about my running, but I’ll also be updating my blog with my progress. You can see all my Philly 10k training posts at this page, or just click the “exercise” link in the navigation. Thank you so much to my friends and family who have supported me thus far as I slowly become “a runner.” When I started running three years ago I couldn’t make it down the block without wheezing. It took a number of false starts to complete my first 5k. Now I’m up to 5 mile runs, and looking forward to running my first 10k. It’s only through your incredible support that I’ve made it this far, thank you so much.